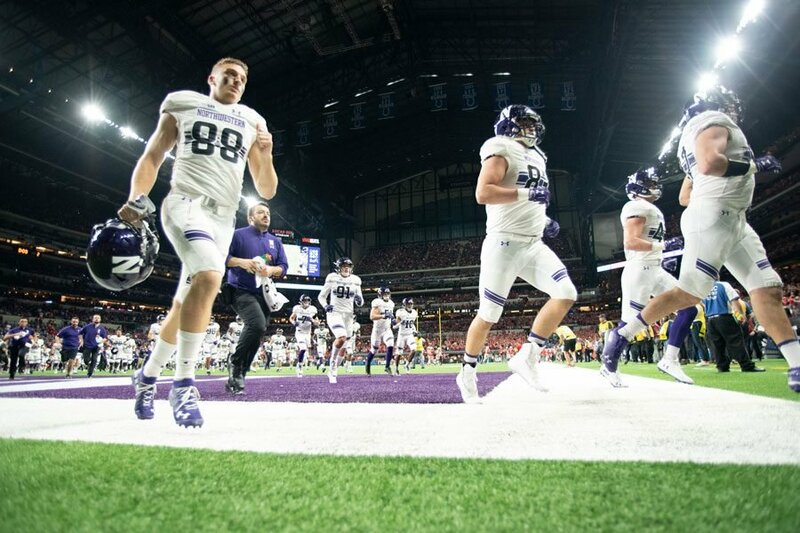 The Cats run out at the 2018 Big Ten Championship Game. Pat Fitzgerald said Saturday that he will not rush to name NU’s starting quarterback. On March 10, 2015, coach Pat Fitzgerald stood in front of reporters and talked about the three-way competition that was taking place to see who Northwestern’s starting quarterback would be in its season opener against Stanford. Then, the battle was between senior Zack Oliver, sophomore Matt Alviti and a redshirt freshman named Clayton Thorson. Thorson would win the job, start against the Cardinals and begin a career that ended with him as the winningest field general in Wildcats history. At NU’s final practice of the spring last Saturday, Fitzgerald was in a familiar spot. The countdown to the Cats’ 2019 season opener against Stanford had begun, and for the first time in four seasons, his team was facing a competition for the starting role under center. Just as he did in 2015, Fitzgerald made clear that he had no intention of rushing the process. There’s one key difference between the transition of 2015 and the one happening this season, though: Hunter Johnson is in the mix. The redshirt sophomore, who was ranked the No. 1 quarterback in the nation by ESPN out of high school, became the favorite to win the job this season nearly as soon as he announced his transfer from Clemson in June. At the start of spring practice in February, Johnson praised the example that Thorson had set in his five seasons with the NU program. Fifteen practices later, he re-emphasized that message and said that his own personal transition into the program was going well. The five quarterbacks on the roster — Johnson, senior TJ Green, junior Aidan Smith, sophomore Andrew Marty and redshirt freshman Jason Whittaker — split reps this spring and will do so throughout the summer until one separates himself, Fitzgerald said. Fitzgerald and offensive coordinator Mick McCall both felt confident about how the new starter would fit into the team’s system. Out of the five contenders, Green is the only quarterback with veteran experience at NU. The senior has appeared in 12 games in the past two seasons, with 22 passing yards and one touchdown under his belt. Smith made one late-game appearance against Minnesota in 2017 but did not record a statistic, while Marty and Whittaker have yet to see the field in their careers. Fitzgerald said the varying levels of experience will be beneficial heading into the summer and then into fall camp.